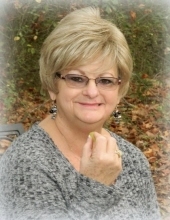 Marilyn Dickerson Clinage Norton, age 71 of Carrollton, passed away January 21, 2019. She was born March 22, 1947 in Washington, D.C., daughter of the late Robert Leonard Dickerson and Madeline S. Arnold Dickerson. She was a 1965 graduate from George P. Butler High School, in Augusta, GA. She enjoyed a 30 year career in the banking industry where most of that time was spent working for SunTrust Bank. She enjoyed using her talents in home decorating and arranging flowers for family and friends. In addition to her parents, she is preceded in death by a brother, Richard W. Dickerson; and sister, Delores Curtis. She is survived by her husband of 24 years, Charles Lamar “Chuck” Norton of Carrollton; their children, Dannie L. Clinage (Ashley) of Big Bear City, CA, Jennifer L. Nightsky (Liam) of Austin, TX, and Chase C. Cooper (Christy) of Windsor, CA; sister, Theresa Dickerson (David) of North Augusta, S.C.; sister-in-law, Debra T. Dickerson of North Augusta, S.C.; brother-in-law, Lester Curtis of Lincoln, Maine; seven grandchildren, Dixie Clinage, Daphne Clinage, Hailey Williams (Daryl), Preston Mixson, Cameron Mixson, Colton Cooper, and Carter Cooper; one great grandchild, Bryanna Williams; and three nephews; Robert (Alisa) Curtis; Zac Curtis & Devon Curtis. The family will receive friends at the funeral home on Monday, January 28, 2019 from 4:00 PM until 7:00 PM. A “Celebration of Life” Service will be conducted on Tuesday, January 29, 2019 at 2:00 PM from Martin & Hightower Heritage Chapel with Pastor Tom Compton and Pastor Frank Bernat officiating. Interment will follow in Pleasant View Baptist Church Cemetery with Bro. Bobby Joe Driver delivering the closing prayer. Those serving as pallbearers will be: Zac Curtis, Devon Curtis, Angel Rodriguez, Raul Alburtus, RJ Alburtus, Kyle Collins, and Mike Marks. Flowers are welcome, but those who prefer may send memorial contributions to the Paralyzed Veteran’s Association at www.pva.org . Messages of condolences can be sent to the family at www.martin-hightower.com . To send flowers or a remembrance gift to the family of Marilyn Clinage Norton, please visit our Tribute Store. "Email Address" would like to share the life celebration of Marilyn Clinage Norton. Click on the "link" to go to share a favorite memory or leave a condolence message for the family.